Dhaka, 15 Dec, Abnews: NASA's Kepler space telescope has discovered an eighth planet in a distant star system called Kepler 90 - the first time a faraway star has been found to have the same number of planets orbiting it as our own sun. The new planet, estimated to be about 30 per cent larger than Earth, is 'not a place you'd like to visit,' said Andrew Vanderburg, astronomer and NASA Sagan Postdoctoral Fellow at The University of Texas, Austin. The Kepler planet hunting satellite has been searching the stars for distant worlds using Google's AI system, which used machine learning to 'find' planets in the Kepler data with up to 96 per cent accuracy. 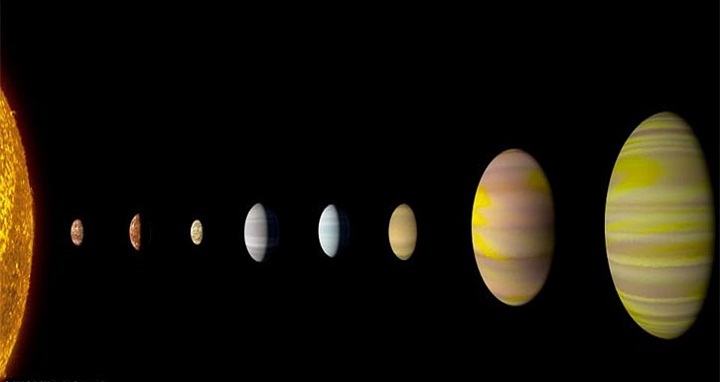 The new planet orbits its star once every 14.4 days.But, all of the planets in this system ‘tightly’ orbit their star, which is thought to be cooler than our own sun, meaning their orbital periods are relatively short. Since its launch, the Kepler mission has been plagued by several setbacks, but has continued to spot new objects outside of the solar system.